The porphyrins can self organize to form macromolecular structures which can self replicate to form a porphyrin organism- porphyrions. The porphyrins can form a template on which RNA and DNA can form generating viroids. The porphyrins can also form a template on which prions can form. They all can join together – RNA viroids, DNA viroids, prions – to form primitive archaea. Thus the archaea are capable of self replication on porphyrin templates. 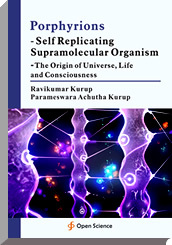 The self replicating archaea can sense gravity which gives rise to consciousness. They can also sense the anti-gravity fields which gives rise to the unconscious brain. The climate change stress mediated increased porphyrin synthesis leads to prefrontal cortex atrophy, cerebellar dominance, cerebellar cognitive affective disorder, quantal perception and Neanderthalisation of the population. Stress induced template directed abiogenesis of porphyrions, prions, viroids and archaea is a continuous process and can contribute to changes in brain structure and behavior as well as disease process.